How many of the golfers who flock every year to the magnificent links of Royal County Down are aware that there is another great Irish golfing experience to be had just a few miles along the south east coast of Down in the fishing port of Ardglass? It is, quite simply, one of the most spectacular courses on the coastline of Ireland, with dramatic elevation changes that offer stunning views of the Irish Sea from every hole as they wind their way from the clubhouse out along the cliffs to a craggy headland then back again. Arglass Golf Club was formed in 1896 when members fashioned a 7-hole course which was soon extended to form a 9-hole layout. It was not until 1970 that the number of holes on the course were doubled to a full 18-hole configuration. The course is kept in tiptop condition with well-tended fairways, tricky pot bunkers and fast, true greens. Shortly after the club’s Centenary, a major decision was made to remove three holes – the back-to-back par five 5th and 6th, along with the short 17th – and replace them with three exciting new holes at the furthest point from the clubhouse, creating a wonderful new loop from the new 9th to 11th holes. The opening five holes at Ardglass are truly memorable as they are routed along the edge of the cliff tops. The signature hole on the course is played early – the 167-yard par three 2nd, called “Howd’s Hole” where the tee shot is played across a rocky inlet to a seemingly small, distant putting surface. Another thrilling par three is the 12th, called “Cathlin” which is played from an elevated tee way above the green located 198 yards away on the edge of the rocky headland. The clubhouse is a bit special too – a 14th century Castle that was once the home of the Fitzgeralds, Earls of Kildare – where you find the atmosphere relaxed and friendly. And if you are in any doubt about any of the above descriptions then view the stunning aerial hole by hole photographs of the course on the club website which is a great example of how to promote a course to the golfing public. Ardglass was the last course on our too short a tour of NI. My first introduction to the course was funnily enough as I stood on the 1st at RCD. Upon telling the starter that we were playing Ardglass the following day, he responded with “She will give you enough trouble, don’t you worry about that”. What stands out for me at Ardglass is it’s routing, it is just perfect. You start with 5 great holes, then it lets you breath until arguably 9 but certainly not 10. 10 to 13 inclusive is again great golf, before a breather until 17 and 18. The breather holes by the way are all really nice with their own challenges. This is a course that does not ease you in, stand on the 1st and make sure you have warmed up as other than the 11th, there is not a harder tee shot on the course. 1 and 11 are my favourites here. 11 is brilliant go left off the tee, lost ball, go right off the tee, lost ball, go left with your second, lost ball, go right with your second, lost ball. I think a couple of other reviewers stated that if you are at RCD make the trip to Ardglass and I couldn’t agree more, but what I would say is that this course is worth the trip on its own. If you have played RCD and not Ardglass, go again for Ardglass. I also agree with other reviewers, this is definitely good enough for GB and Ireland top 100, of our tour we all preferred the course over Castlerock and we struggled to work out the better of this and Portstewart. A truly magnificent course. The course is incredibly fun to play and represents excellent value for money (a winning combination!). There are some really memorable holes. Holes 1 – 5 are breath-taking and hug the coast line (it is hard to pick a favourite but I would probably just opt for the 1st over the 2nd, but it’s a debate to be settled over a beer in the impressive club house). The par 3 5th hole is only 125 yards but a mixture of an elevated tee box, a small green complex and a swirling wind make a par on this hole feel like a birdie. Holes 6 – 9 are all strong but lack the wow of the first 5 holes. The course really comes back to life on the 10th (a great par 3) and is followed by the iconic 11th (a wonderful par 5 that reminds me of the 18th at Pebble Beach and my favourite hole on the course) and the signature 12th hole (reminiscent of the 7th hole at Pebble Beach). I personally think the 13th hole is very underrated but the run for home isn’t quite as exciting as the early holes on the front 9 but the 17th and 18th holes are excellent risk reward Par 4s and will make any tight match ups particularly exciting. In my humble opinion, I think this course is a contender to break into the GB&I top 100 golf courses. This is a great course. If you have travelled to play RCD dont leave the area without playing here. There is nothing I can say that hasnt already been said in previous reviews except that they have added numerous new bunkers which makes the course tougher and better. This wonderful gem proudly sits in my top 3 courses where measuring the all important "glad to be alive" factor (alongside Cruden Bay and Bamburgh Castle). You are never apart from the sea, and at times you are nearly in it! Stunning views of the rugged Down coast, and the Mountains of Mourne to the south. There's also some pretty good golf to be had! Holes 1 and 2 are real knee knockers with carries required over cliffs, and anything left will be swallowed up in the waves. 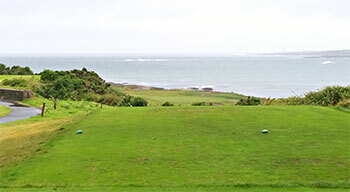 The spectacular golf continues, with highlights at 11 and 12, 11 a brutal par 5 along a beach, with thick gorse left and rocky beach OOB right either side of a narrow fairway with a brook running through it, then 12 a glorious par 3 playing from a high rocky outcrop down back to the sea. The weakest part of the course is probably 14-16, but 17 and 18 are crackers, 18 in particular a classic risk/reward short par 4 that can end in eagle/birdie or much much worse. Luckily for me it was a birdie. I can still picture several of the holes so clearly in my mind a few weeks after playing, a sure sign of a course well worth travelling for. The only negative was the speed of the round (and I don't mind a slow round). 2 big groups of Americans ahead (playing off back tees when they really shouldn't have been), slowed us down to 5 hours (despite them going round with caddies!). Meant we didn't have time to enjoy a beer in the spectacular castle that is the clubhouse. Many overseas visitors when coming to Northern Ireland usually have the desire to book tee times at both the Championship 18 at Royal County Down and the Dunluce Course at Royal Portrush. And for good reason. Both are world class -- rightly rated among the world's best. The flip side is that both courses are especially demanding -- pity the hapless player unable to control one's tee shots consistently. The steady diet of looking for lost balls and then reloading time after time can be fatiguing to say the least. Amazingly, just 30 minutes from County Down is a layout blessed with stellar scenery and a worthy test without all the grueling rough to inhibit one's backswing. 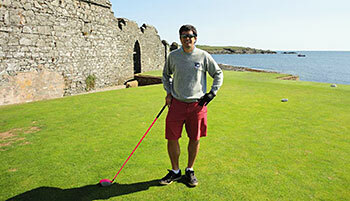 Ardglass Golf Club represents the kind of "fun" golf many players need to include when in Northern Ireland. While the course is not overly long -- make no mistake about it -- winds can whip off the Irish Sea adding a good bit more to any hole played. 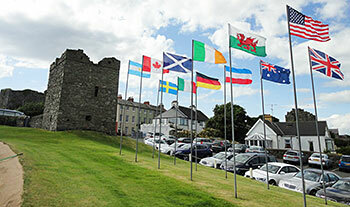 The 1st tee is located immediately next to a magnificent castle structure that serves as the clubhouse. With water to one's left -- the short par-4 opener turns left then uphill to a green set in a saddle with ample rough serving to thwart the half-hearted play. The best angle is from the left side but be forewarned on the high grass that awaits. Be especially mindful if the pin is placed in the deepest area of the green. Possible birdie -- yes. Possible double-bogey too! A vintage opener to get the golf blood flowing. The 2nd is a solid 167-yard par-3 -- again with water to the left for an engaging view with a green totally exposed to the elements. The next two holes also follow the coastline -- both are short par-4's. The 4th is particularly well done -- the preferred landing area is left center which is hard to accomplish given the proximity of the rough and coastline on that side. However, if one misses too far right there is a large grass dune blocking one's path very effectively. At the short 5th you face a drop-shot par-3 featuring a putting surface maddeningly difficult to hold with any serious wind blowing. Once you reach the 6th the course swings inland and the holes encountered are fairly repetitive and don't really add much to the total equation. They are sufficient -- but not especially noteworthy. That changes with the start of the back nine -- following another downhill par-3 at the 10th -- the par-5 11th is exceptional. Lined with gorse left and a parallel sea wall to the right. Birdie is possible but not without being in play right from the start. The 12th is a quality par-3 that follows and the par-4 13th is well done -- turning left in the drive zone and ending with a subtle green that is hard to fathom. After the 13th you play another series of holes that are fairly rudimentary -- not bad per se -- just not memorable. The concluding trio is a return to quality. The 16th slides uphill -- the green elevated above the fairway. The 17th is good short par-4 with another elevated target. The final hole is a quality closer - presenting a slew of options -- from driving the green to possibly throwing away one's round with a foolish play. At 345 yards and going downhill - the temptation is there. Do you go for the max? Do you play conservatively? The thing about 18 is that those who bailout right will face a devilish pitch uphill to a narrow green. There is a speed slot and one an fit the tee shot to this area the reward can mean an eagle putt. It's a fascinating hole because the numbers can be so varied among all players. Ardglass provides a design that wants players to get emotionally connected -- relishing fun shots played well. Not endless slogs with little hope for success. Too many links courses have overdosed on the inclusion of brutal rough - making holes more demanding does not add to greatness but simply shows a weak crutch unnecessarily added. Elasticity in design is not about accepting mediocre plays -- but giving players space to elevate themselves. Ardglass provides such a platform -- combining scenic vistas and enough quality holes to carry the day. The scorecard says "Stunningly Natural Naturally Stunning". After playing Ardglass during the afternoon on Sunday July 26th with my son, the views were strikingly impressive and thoroughly enjoyed playing the course despite the high winds and heavy rain conditions. I must say the playing conditions were about the worst I have ever played in. We truly got to experience the wrath of the Irish Sea. The next day after playing Royal Portrush a golf tour operator said the conditions on Sunday were the worst he has experienced in his 12 years on the job. He said his group had delays due to extremely high winds. Not only were the winds howling on this day but the rain also never stopped. Ardglass was an extremely challenging test of golf and pars were very difficult to achieve on any of the holes. 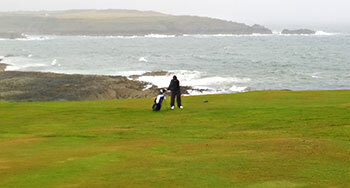 Would like to play Ardlass again on a less brutal day. My son and myself virtually had the course to ourselves as I could understand why not many golfers would want to play on this day, at least the time we played. As far as the condition of the course, I thought the greens were better than Royal Portrush and high praise to the greens crew as the tees, fairways, and bunkers were all in excellent condition. My favorite holes were the holes tha t hugged the Irish Sea coastline and they were certainly stunning. I especially enjoyed the first 5 holes and the par 3 12th and par 4 13th. On this day the 13th was certainly the most difficult as we played directly into the howling wind and the heavy rains almost hurt walking into it. Playing the 18th hole was a nice way to end the day. The views again were stunning highlighted by the 14th century majestic castle clubhouse, the 14 flags from various countries behind the green whipping in the wind, and of course the waves crashing into the coastline. Played this as a bonus on the way up from Dublin to RCD. Memorable, unusual course with an amazing opening few holes. I was worried I was going to run out of balls after 3 holes with the prevailing Southerly turning the first few holes into a cliff and gorse studded nightmare. My heeled drive from the cannons in front of the clubhouse (told you it is unusual !) on the first just failed to gain the fairway leaving me with a fairly unique sideways recovery shot back up to the fairway from a grass pathway between 15 ft rock walls. There are a few relatively humdrum back and forth holes in the middle but most of the holes are in outstanding runs finishing with a relaxing pint in a great clubhouse with really friendly, interested members. Would be five balls with a bit more variety in some of the flatter holes. However, the sunny coast drive south to Newcastle with the Mountains of Mourne slowly coming into view will live with me forever and ensures that Ardglass will always be a fond memory and would love to go back. What a start to the round at Ardlass! The cliff top par four 1st and par three second 2nd are as good as you will encounter anywhere, with both holes demanding nothing other than mighty heroic carries across the jagged rocky coastline to far distant greens. Another couple of thrilling par three holes follow on the front nine: the 151-yard 5th, played downhill to a green fronted by a couple of fiendishly positioned bunkers and the 219-yard 7th, where an old cottage to the right of the green stymies pushed tee shots. Continuing the memorable par three theme, the “Amen Corner” section of the course at holes 10 to 12 begins and ends with long one-shot holes that plunge down to the water’s edge from elevated tees benched high into the hillside above. There’s a bit of respite to be had in the latter stages as holes are routed inland, away from the coast, before the downhill 18th returns golfers back to the seaside in front of the castellated clubhouse. It’s hard to expect Ardglass to compete against the more salubrious world class links courses in the north of Ireland but it more than holds its own with the best of them, offering an engaging cliff top test of golf that’s guaranteed to entertain from start to finish. I was told some months before going, when some customers came back, that the course was not that good despite 5 great starting holes and a couple more that were worth. I have to say unfortunately totally disagree with my customer! I arrived early in the morning on a sunny and windy day in August, with the good luck to be playing in bermudas! I was marveled by the old building of the Club House and gave a walk inside to learn some more history about the course, which was fantastic. Then I received my 24 golfers group spending some time between the putting green (which rolled at 10 feet at least) and first tee taking pictures of them. Finally it was my time for the round with the club captain, which is a very big honor as a visitor. First hole is one of the most challenging opening tee shots I have faced, where you have to carry more than 200yds and also be precise to have a better angle to an elevated green in between the rocks. It was very nice to start with a birdie from 20 feet downhill which rolled extremely pure. Then second is a dramatic over the cliff par 3 which that day played 165yds into the wind. 3 and 4 2 great par 4s, one of them with the semi blind shot which made it tough into the wind. All 4 holes go along the cliff on the left. Then 5th is a nice par 3 where if you hit the right side bunker you need to donate money as it is called the “Captain´s Bunker”. After that 6-7-8 are just standard holes which in my opinion might need some creativity to make them more interesting. 9-10-11-12-13 is a stretch that I loved starting on a great par 5 uphill with a very tough second shot. 10th is a tough par 3 that ends by the shore before a spectacular par 5 (11th) with the shore on the right and a very well protected gree, in which pla ying into the wind I hit the shot of the week with my 3 wood to 2 feet for an eagle. 12th is a dramatic downhill par 3 in which hybrid was the club and then 13th is a very tough par 4, long and with a blind second shot. 14-17 have nothing special before very nice finishing hole, where the elevated tee and downwind made it reachable with the tee shot. The views there of the ocean and the club house are amazing and maybe the nicest I was able to experience in Northern Ireland. After the round a big dish of mussels completed a very nice experience which I really hope to repeat. If you go to this part of the country, you have to play the course. Some holes maybe just “standard” but the views all along the way and more than half of the holes are thrilling. Very well kept, fast and true greens, crew very kind and helpful, everything at Ardglass is just as a golf course has to be.